Writer/director Joon-ho Bong’s Snowpiercer does what the sci-fi genre does better than any other cinematic medium: examines modern life by asking a surreal “what if.” The “what if” in this case being a metaphorical examination of the redistribution of wealth and the subsequent inability of the poor to climb the social ladder using a postapocalyptic ice age and Tilda Swinton with goofy teeth. Wait! It works! I swear! Snowpiercer is actually built on two modern social crises: global warming and the rising plutocracy. Set in the very near future, climate change has progressed to the point where even Ann Coulter has to admit the weather’s messed up. In a panic, scientists spread a chemical into the atmosphere “Cat’s Cradle” style, and the whole world winds up a giant igloo. The only survivors are those who boarded a former luxury train that circles the world annually without stopping thanks to a crazy perpetual engine. In quite possibly the most literal sci-fi metaphor ever, the rich live lives of luxury at the front of the train. The poor are bound to the back, where they are crammed in tight quarters, eating “protein bars” made of stuff that makes hot dog ingredients sound delicious. Previous attempts at revolution have failed during the 17 years since Earth became a popsicle. But Curtis (Chris Evans) and his mentor Gilliam (John Hurt) have a new, albeit very uncomplicated, plan: Bust security expert Namgoong Minsoo (Kang-ho Song) out of train jail and get him to open the locked gates that lead to the front of the train, fighting cart by cart until they control the engine. If you’ve never had the pleasure, and I do mean pleasure, of watching one of Bong’s films, be prepared for whiplash-inducing changes in tone. 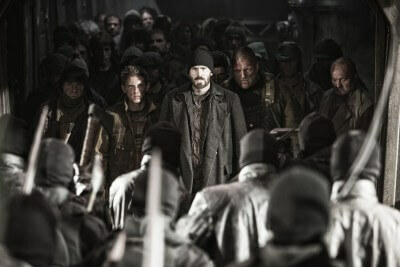 In what is fast becoming his trademark, Snowpiercer abruptly shifts from grim-dark murderfest to broad surrealist comedy to moralizing parable. And somehow it works. It shouldn’t be possible for Evan’s tortured Curtis to share a scene with Swinton’s absurd Mason, but Bong pulls it off flawlessly. The entire cast, including Jamie Bell, Ed Harris and Octavia Spencer, manage to navigate the potential minefield of unintentional comedy with remarkable aplomb. Although Snowpiercer’s metaphor is absurdly explicit, the take-home message is more nuanced. Without spoiling things, Bong does not offer false hope to real-life, would-be revolutionists, suggesting a complicated and chilling outcome if true change is achieved. What’s nice is that the film can be enjoyed for its ridiculous action, consumed for its eccentric comedy or celebrated for its complex commentary. If you happen to enjoy all three, it’s a near masterpiece. Bong’s first English language film is a towering accomplishment born of immense creativity, social awareness and a fearlessness that few mainstream American directors possess. It’s the kind of film brave enough to completely stop before the final fight and let its main character unload a chilling, heart-rending soliloquy. In short, Snowpiercer is the kind of movie we need and get too few of these days.